Mystery surrounds the disappearance of a Southern California family of four who were on a road trip and never arrived in the Bay Area. SAN JOSE, Calif. (KGO) -- Mystery surrounds the disappearance of a Southern California family, a mom, dad, and two young children who were on a road trip and never arrived in the Bay Area. Search efforts intensified Wednesday for the family of four who may have been swept away into a river. Search efforts intensified Wednesday for a Southern California family of four who may have been swept away into a river while on a trip from Portland to San Jose. Pat Berkowitz is recalling the terrifying moments he saw what is believed to be the family's vehicle roll over an embankment and disappear in the Eel River north of Leggett. "I heard my wife say 'oh, oh, oh' and at that time the car kept going straight and it was going off the pavement," he said. Berkowitz attempted to go down the embankment 15 to 20 feet. "And so I'm yelling, 'hello, hello, anyone there?"' he asked. Authorities say the SUV matches the description of the vehicle the Thottapilly family was traveling in. The family was in a maroon/burgundy 2016 Honda Pilot with California license plate 7MMX138, police said. On Wednesday, a California Highway Patrol helicopter and Humboldt County Sheriff's Department motorized boat joined the search. Search and rescue teams are using sonar to search the water. 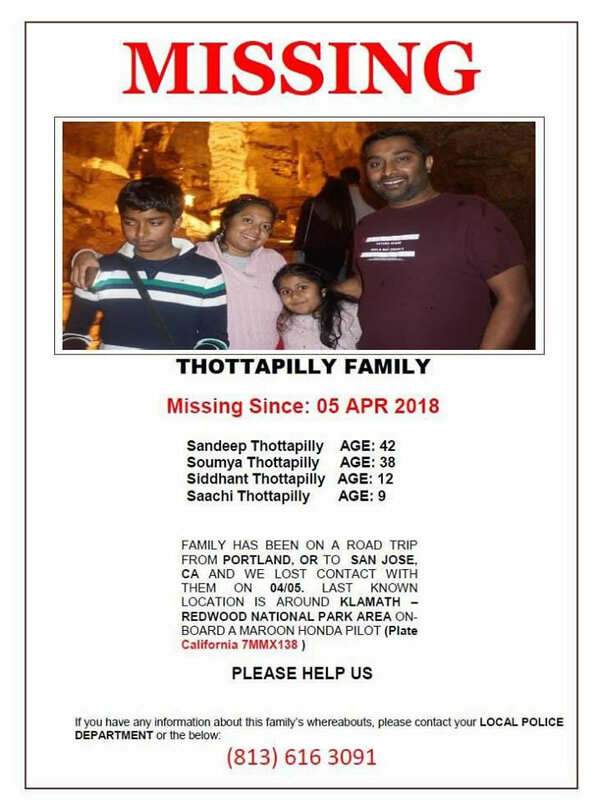 The Thottapilly family was on their way from Portland to San Jose when they stopped communicating with family and haven't been seen or heard from since Thursday, police said. "We're Indian, I feel close, this is sad, I really feel sad for that family," said Valencia neighbor Sandy Singh. Neighbors have been leaving flowers outside the family's Valencia home. "They're very sweet people, very nice, the children are well behaved," said neighbor Joe Romero. A note of hope in part reads, "your neighbors will continue to pray for you and your family"
As the search for the vehicle continues, Garberville CHP has said river conditions are improving, but so many feel helpless. "There's 100 different scenarios," said Romero. "You know running back to help it's horrific," said Berkowitz. Once the vehicle is located, divers will determine if there are bodies inside. A missing person's report was filed for the family on Sunday. "They were just going on a road trip and they were very excited," a friend of the Thottapilly family, Laura Knightley, told ABC news. "Very excited to do the Oregon Trail."